The Derby defender is back at Pittodrie after 19 appearances in the first-half of the season. 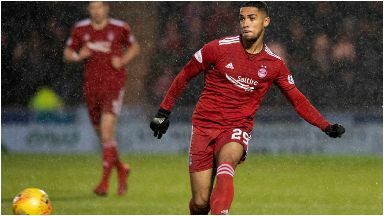 Aberdeen have re-signed Derby left-back Max Lowe for a second loan spell this season. The 21-year-old started twice for Derby this month but has been allowed to rejoin the Dons amid reports County boss Frank Lampard has made an offer to former Chelsea team-mate Ashley Cole. Lowe made 19 appearances for Aberdeen in the first half of the campaign. Dons manager Derek McInnes told the club's official website: "It's brilliant news. We were looking at a number of left-backs but when the opportunity arose to bring Max back it was one that we were keen to pick up where we left off. "We didn't want to lose him in the first place." McInnes added: "He showed everyone the potential he's got earlier in the season and we hope we can get that and more from him more during the second half of the campaign." Frank Lampard told County's official website: "Max is very much our player and remains in our long-term plans, but we felt for his long-term development it was important for him to continue to get regular first-team matches. "Aberdeen is a fantastic place for him to do that. He has really progressed under Derek McInnes and we have a great relationship with him. He added: "It'll be good for Max to get more games under his belt and return to us in the summer ready for next season." Meanwhile, McInnes is still hoping to extend the stay of skipper Graeme Shinnie beyond the summer following reports the midfielder was set to sign a pre-contract with Wigan. "I know Paul Cook, the Wigan manager, he is one of my best friends in football, and he was quick to phone me and say there was absolutely nothing in it," McInnes said. "I certainly think he is more than considering staying at Aberdeen. But Graeme did say to me back in September/October he just wanted time to consider everything. "I said before he is quite within his rights with that. He did indicate he would let me know in January and we still have a lot of January to go. "At the minute my concentration is to get players in if we can but if Graeme wants to come and see me the door's always open." He added: "We have a really strong relationship and I'm still hopeful we can find a way for Graeme to stay at the club. Nothing has changed on that."